Never ones to turn the other cheek in a rap battle, unless that rap is about the virtue of turning the other cheek, a group of Christian hip-hop artists are suing fallen Christian singer Katy Perry, claiming that her song “Dark Horse” plagiarizes their 2008 song, “Joyful Noise.” What’s more, the suit argues that Perry’s track has “irreparably tarnished” their own by association with its “witchcraft, paganism, black magic and Illuminati imagery”—the harshest accusation of its sort since the “Dark Horse” video came under fire for being offensive to Muslims. Also, since “California Gurls” irreparably tarnished cupcakes. Missouri-based Christian rappers Flame, LeCrae, Chike Ojukwu, and Emanuel Lambert say they recently became aware of the songs’ similarities to their own after fans began pointing it out online, catching the attention of Flame’s DJ, Cho’zyn Boy. Over at Rapzilla, Cho’zyn Boy made a mash-up of the two tracks, which illustrates how both songs use a very similar, simplistic synthesizer melody, while also tarnishing “Joyful Noise” with Katy Perry’s black magic more directly. Of course, bearing a similar synthesizer melody (albeit slowed and shifted) isn’t necessarily grounds for ruling that Perry and her production team copied “Joyful Noise”—especially as “Dark Horse” supplements that melody with arrangements and flourishes that aren’t in the former. So it’s possible that Flame, LeCrae, et al. 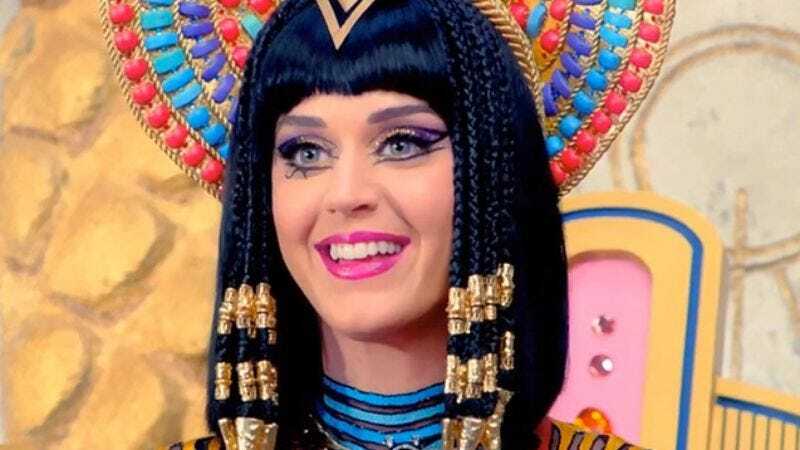 may have more luck pursuing their latter argument that Katy Perry is a witch.